It’s summer in California and nothing beats driving around with the top down. Whether you’re meandering down the Pacific Coast Highway, cruising the El Camino Real, or just driving home from a long day at the office, the sunshine state is ideal for soft tops. BMW has just the answer for folks looking for stylish top-down motoring, with both the 3-series and the new 1-series featuring convertible models. But for true driving excitement, the only choice is the Z4 roadster. This head-turning two-seater combines distinctive styling with BMW’s signature blend of luxury and performance. Slide into the Z4 and you immediately notice its sporting potential. The car sits very low to the ground and the two front seats are placed quite far back relative to the wheels. The seats are so low that getting in and out of the car proved a bit of a challenge at times, especially after a large lunch. Hit the road and you can’t help but notice that other cars practically loom over you, but this go-kart like stance allows the Z4 to truly hug the road. Estimated fuel economy for the Z4 3.0si is 18 mpg in the city and 28 on the open highway. Our overall mileage during our week with the Z4 roadster was a little over 22 mpg. Expect better gas mileage on days you can resist launching Z4 down the roadway. We behave poorly whenever we get the keys to a hot roadster. Our Z4 3.0si test model features a sophisticated 255 hp 3.0 L inline 6 cylinder engine, an upgrade over the base model’s 215 hp 3.0 L unit. Utilizing an assortment of power maximizing tricks, including a composite magnesium/aluminum engine block and Double-VANOS variable valve timing, this engine provides both healthy doses of torque and a free-revving eagerness that easily launches the car forward. Stand on the throttle and you’ll hit 60 mph in a scant five and a half seconds, which should leave all but the extreme speed freaks nicely satisfied (for those folks there is always the Z4 M, with its 330 hp engine and sub 5 second 0-60 time). Our test car came equipped with an optional 6-speed Steptronic automatic transmission with paddle shifters. Although purists will surely stick with the standard 6-speed manual transmission, this automatic is really quite good. Activate the Dynamic Driving Control, or sport mode, and the computer does an excellent job of anticipating what gear the transmission should be in for maximum performance, even when driving hard on steep terrain. Should you choose to take matters into your own hands, all it takes is a quick tap or pull on the steering wheel mounted paddle shifters to easily change gears. 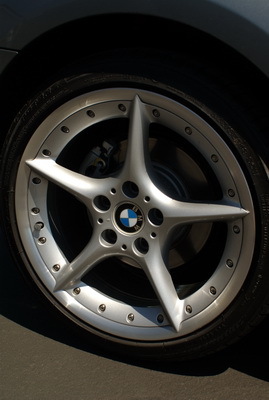 Our Z4 also came equipped with the optional sport package, which includes 18” rims shod with high-performance tires and a sport-tuned suspension. These unforgiving dampers will make an impression on you, your spine, your hands, and anything else in contact with the car. On anything other than smooth pavement the ride is too jarring to be comfortable and it gets downright painful over the typical washboard road surface of our nation’s neglected infrastructure. This is not the car for a long road trip, unless you love spending time with your chiropractor. Take the Z4 out on some curvy back roads and you’ll almost forgive the car for its excessively harsh ride. With perfect 50-50 weight distribution and a surprisingly stiff chassis for a convertible, the Z4 makes carving switchbacks an absolute delight. Add in the supremely sticky Bridgestone Potenza tires and responsive, fade-free brakes, and you have a recipe for cornering precision. Perhaps the only handling flaw is a slightly vague steering response, but this is more nitpicking than a serious limitation. Overall, the Z4 is solidly put together, with uniform body panel gaps and doors that close with a resounding “thunk”. The optional fully automatic convertible top works flawlessly, with the simple push of a button raising or lowering the top in little more than 10 seconds. The only area that stands out for slightly less than stellar workmanship is the interior, with some mediocre plastic surfaces and a pair of retractable cup holders that jammed several times. For those concerned that driving a convertible might be less safe, the Z4 has you covered, with BMW’s Advanced Safety System making sure that the airbags, ABS, and traction and stability control systems work together to keep the occupants safe. The Z4 features an appropriately sophisticated interior, with black leather upholstery and brushed aluminum trim. The M Sport seats are very supportive, almost too much so given the stiff suspension. A bit more padding would really help, especially for longer drives. Interior space is decent for a convertible and the trunk is large enough to be functional, although anything bigger than a medium size suitcase likely won’t fit. The dashboard layout is nice and simple, without the button overload common in many luxury cars. Operating the Navigation system using just two buttons and a knob did prove rather difficult, and the user interface as a whole is less than intuitive. Why more car companies don’t adopt touch screen technology remains one of the world’s unsolved mysteries. On the other hand, the optional premium audio system is the real deal, with THX® certification, MP3 capability, Carver technology and 10 audiophile-quality speakers, including 2 subwoofers. This system can really crank out the tunes, with almost no distortion even at irresponsibly high volume levels. Like many of BMW’s recent designs, the Z4’s exterior generated some controversy when it was unveiled in 2003. Abandoning the more retro-styled exterior of its predecessor, the Z3, the Z4 has an almost shark-like profile, with its aggressive, pointed nose, curved door lines, and sharply tapered rear end. Add in our test car’s optional 18” alloy wheels and you have a muscular, yet abstract look that is quite unlike anything else on the road. The overall look won’t please everyone and is a bit cluttered from certain angles, but give it some time and the Z4’s unique profile will probably grow on you, and will definitely help you stand out from the crowd. With an as-tested price of over 55,000, the Z4 Roadster 3.0si isn’t cheap, especially for a car with such limited practical utility. With a ride so harsh that it almost precludes daily driving and the space limitations that come with being a two-seat convertible, the Z4 is unlikely to be anyone’s primary mode of transportation. But judge it for what it is, an expensive thrill ride from one of the world’s great car companies, and it’s hard to top the Z4. Combining all-out performance with a sophisticated design and the sheer fun of a convertible top, the Z4 could be the perfect second car. Not sure what you are comparing to for handling, it is not as good as I would expect. The clunky ride is more likely due to the run flats. Try some regular Potenza’s out.